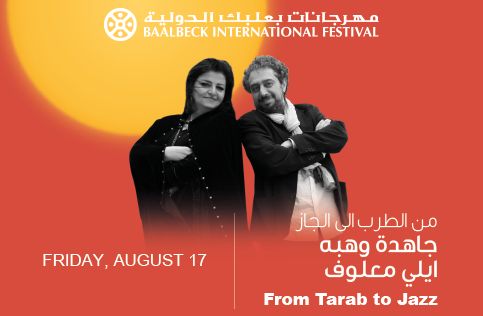 A musical encounter where East meets West, where Tarab meets Jazz, with two talented performers : the pianist and composer Elie Maalouf and the great singer Jahida Wehbé. This concert will feature Elie Maalouf’s compositions performed with his musicians as well as Jahida Wehbé’s songs. It will also feature some carefully chosen musical pieces from the classic arabic repertoire and an exclusive « Baalbeck overture ». This promises to be an enchanting evening inside the Bacchus Temple. Virgin Megastores City Mall, Virgin Megastores ABC Achrafieh, Virgin Megastores – Beirut Souks, Virgin Megastores – City Center, Virgin Megastores – ABC Verdun. Casino du Liban, Bookstop – TBO. Ticketing Box-Office (Dar El-Chimal), AS Company – TBO | Zgharta, Daleel Akkar – TBO. Al Ittihad Book Shop – TBO, Daher Travel. AS Company – TBO | Amchit.